There are a lot of memorable experiences that take place during the course of a water or fire loss. There’s the initial discovery moment where you realize your feet are not cold because you forgot to put socks on – It’s because you stepped into 2” of water in your dark basement at 2am. Or when you realize you’re going to have a bunch of loud equipment running in your kitchen or workplace for more than just a day. Or maybe you’re the business manager who walked in on water raining from the ceiling of your office – Whatever the situation is, we know that there are a lot of uncomfortable moments during the course of converting your home or business from chaos back to calm. One of the things Spectrum cares most about is the client experience. 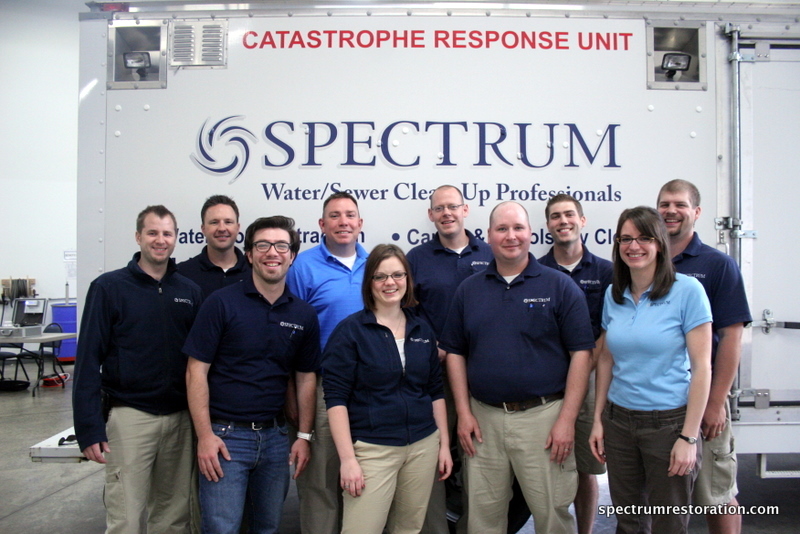 We’re proud to be able to say that the people that work here at Spectrum truly care for the well-being of people impacted by a water damage or fire damage loss at a home or business. We staff an incredible team of people that are capable of truly empathizing with each client, be it an administrative team-member, or be it the technician in your home setting up drying equipment. Each loss is not just a job, it’s an experience – it’s a momentary pause in life where everything gets turned upside down and rattled around! And Spectrum understands that these experiences can be very difficult to deal with in the midst of life. One of our main goals that we strive towards is an experience that guarantees a client is happy with the process AND the end result of our service. At Spectrum we do our best to make enduring a loss at your home or business as comfortable as possible. Anything can be fixed, and often it’s the process that has the greatest impact on the people experiencing the service, not just the loss itself. From the initial call to the final invoicing process, Spectrum is committed to the client first, and to doing our best to make sure that your experience is memorable in a GOOD way!